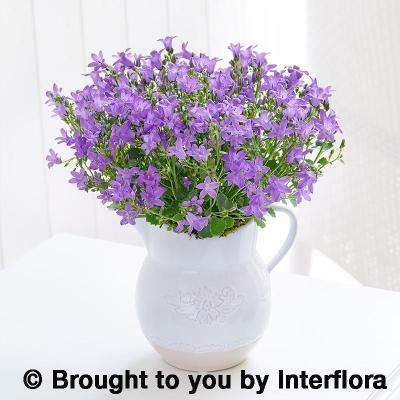 Featuring a purple campanula planted in an embossed ceramic jug. 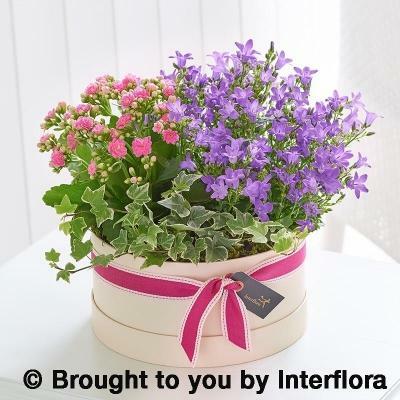 Featuring a purple campanula, cerise kalanchoe and trailing ivy arranged in a hatbox trimmed with ribbon. 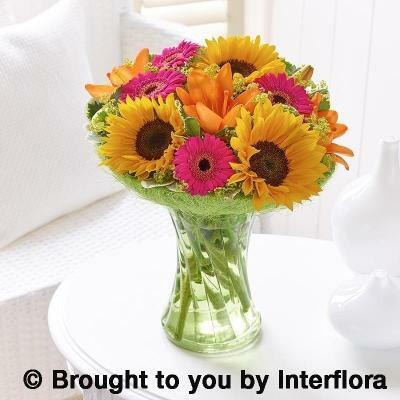 Sunflower Perfect Gift is great gift to brighten up anybody's summer day. 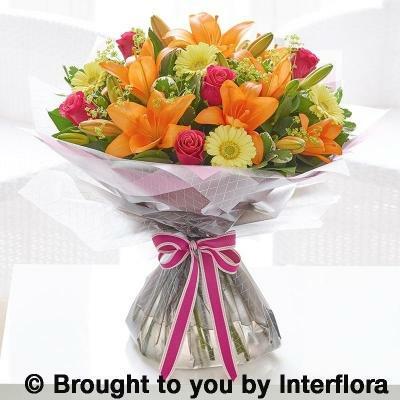 Created in a Lime Swirl Vase with Lime Sisal Collar with flowers like Sunflowers, Cerise Germini,Orange Lilies and foliages. 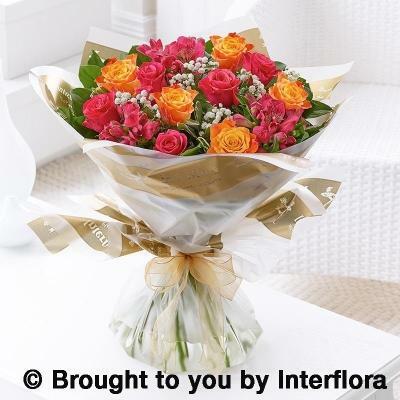 Featuring orange large headed roses, cerise alstroemeria and cerise large headed roses with white gypsophila, salal and pittopsorum, hand-tied, gift-wrapped and presented in Interflora Gift Packaging. 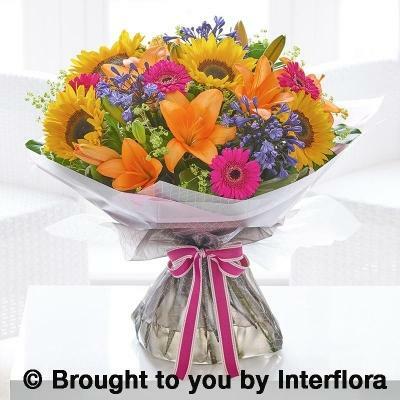 Agapanthus and Sunflower Hand tied is one of the most popular designs for summer . 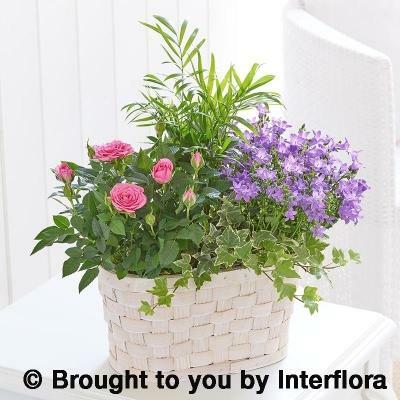 Created with flowers like Cerise Germini , Orange Lilies, Sunflowers,Blue Agapanthus and mixed foliages. Displayed in a Chic Black Box and wrapped in the Statement Stencil Florawrap Frosted. 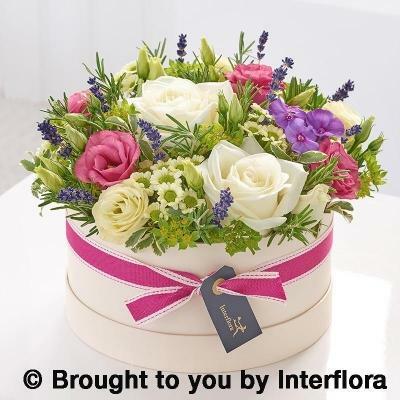 Featuring white large headed roses, pink lisianthus, cream lisianthus, purple phlox, green bupleurum, rosemary, cream chrysanthemum, pittosporum and dried lavender, arranged in a hatbox trimmed with ribbon. 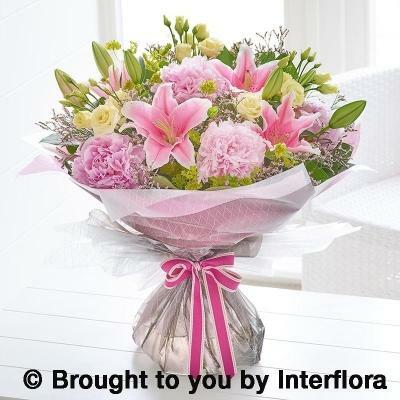 Peony and Lily Hand tied is a beautiful way to bring summer inside . 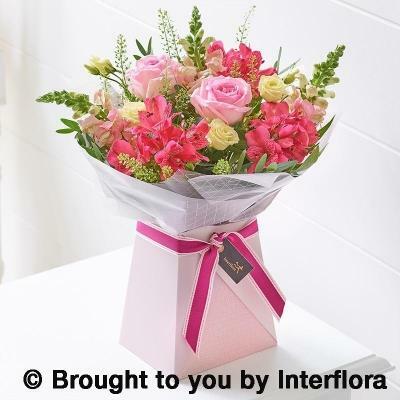 Created withPink Oriental Lily ,Pink Limonium,Pink Peony,Cream Lisianthus and Mixed Foliages . 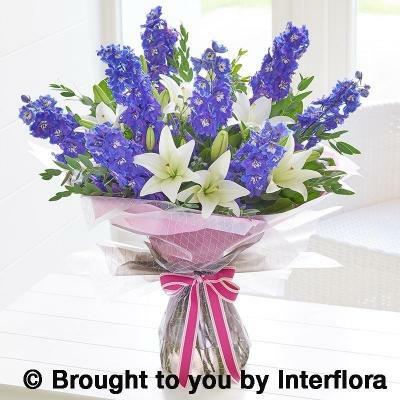 Delphinium and Lily Hand tied is sure to impress. Created with Blue Delphinium,White LA Lily, and mixed foliages . Wrapped in Statement Stencil Florawrap Frosted and displayed in Chic Black Box . 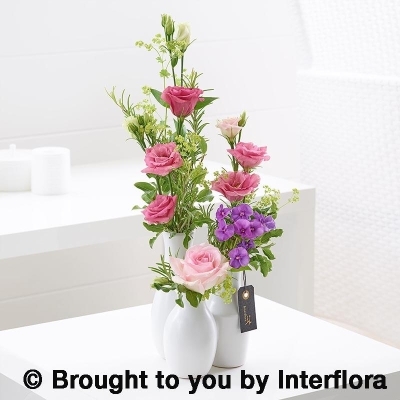 Delphinium Dreamy Vase is sure to impress. 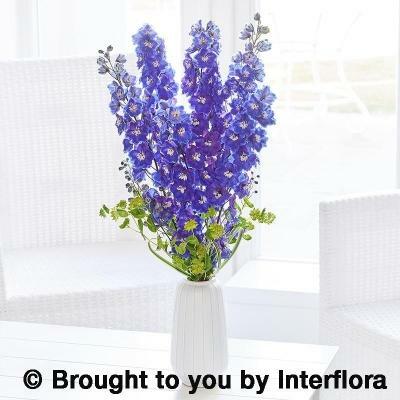 Created in a Tall White Ceramic Vase with Blue Delphinium,Green Bupleurum,China Grass. 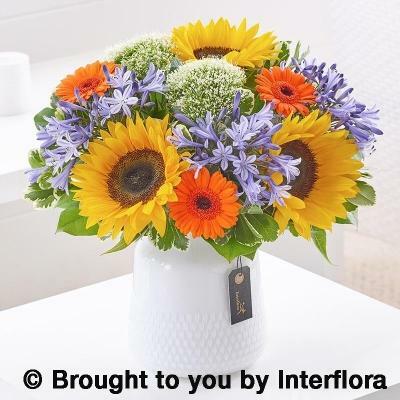 Sunflower and Agapanthus Vase is a beautiful gift for table centre . Created in a Textured White Collar Glass Vase with Blue Agapanthus, Orange Germini , White Trachelium, Sunflower and mixed Foliages. 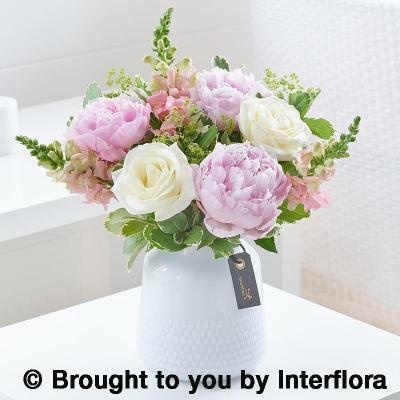 Peony and Rose Vase is simple gift just say you care . 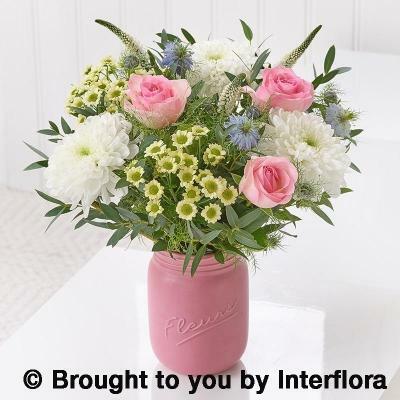 Created in a Textured White Collar Glass Vase with Green Alchemilla Mollis, Pink peony , White Rose ,Pink Antirrhinum and Mixed Foliages . 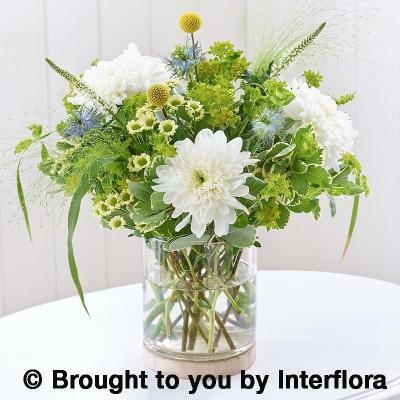 Featuring white chrysanthemum blooms, cream spray chrysanthemums, green bupleurum, blue nigella, white veronica, yellow craspedia, pittosporum and panicum fountain arranged in a glass vase.